It wouldn’t be Fall in Vermont without a little apple picking! We headed out to one of my favorite orchards for some apples, cider donuts, pumpkins, and to let Max admire the tractors (one of his favorite activities these days). 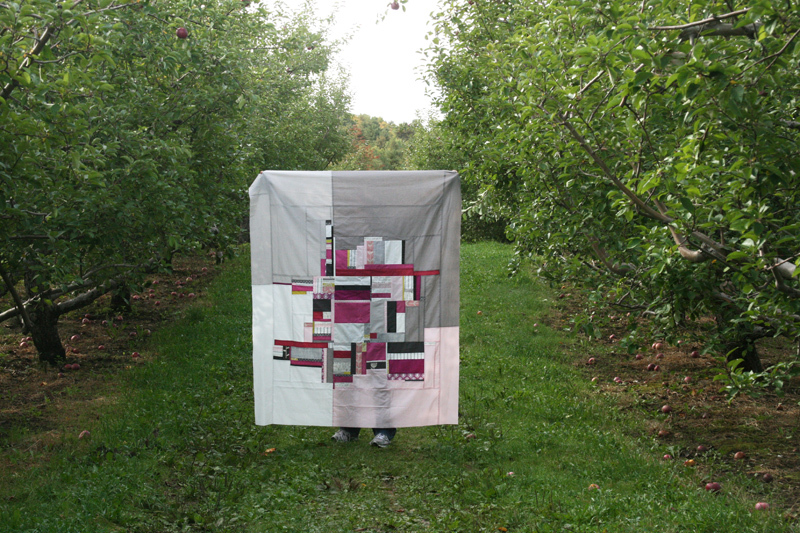 Of course I brought a quilt top along for a few photos – the orchard seemed as good a place as any for a quick little photo shoot. This quilt started out as the stack shown here. I love the combo of the dark gray, pink, plum, and lemon, but when I started sewing them into a herringbone type block design, I wasn’t loving how dark it was and I felt the yellow was kind of taking over. I ended up adding several additional solids, including some extra light pink and some grays and off whites, and really limiting my use of the yellow. And I decided to forgo the herringbone for some improv-pieced strip sections. I usually have some idea of how I want a quilt to look, but here I had absolutely no idea. 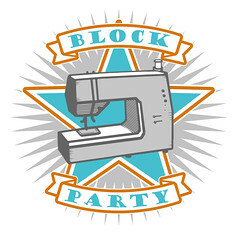 Other than the fact that I wanted to sew strips together, I was kind of clueless, and in fact this stuck around on the design wall for quite some time. I decided to just stick with the strips, pieced in variously sized sections, and see where it went. I’m really happy with how it turned out, and I guess it serves as a reminder to myself that it’s not always necessary to have a specific plan in place! 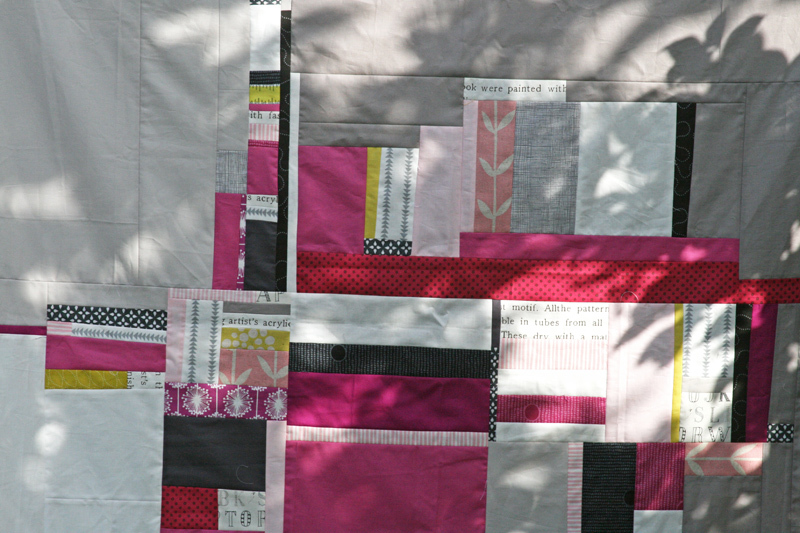 This entry was posted in Fabric, Posts about Quilts and tagged improv quilt, pink and gray, quilt, quilt top, strip sections, strips. Bookmark the permalink. Love it. 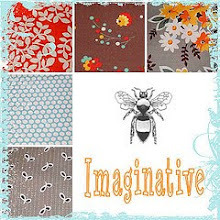 I have not tried improvisational quilting yet. I love the way it turned out. Max is sure a cutie. I love this! The uneven outer solid quadrants make the quilt. They put all the focus in the center at that beautiful plum color. Amazing job! I love it!! Especially the mixing it up with the background fabric!! Beautiful. Wow! Actually, what I like about it is that it has this Arts & Crafts feel, you know, like Frank Lloyd Wright-ish. Super job. And, Max is so adorable! it’s beautiful, Ashley and those Skinny Laminx pieces work a treat…as do the splashes of yellow…gorgeous! I love your resulting composition, especially the colour blocked border areas! 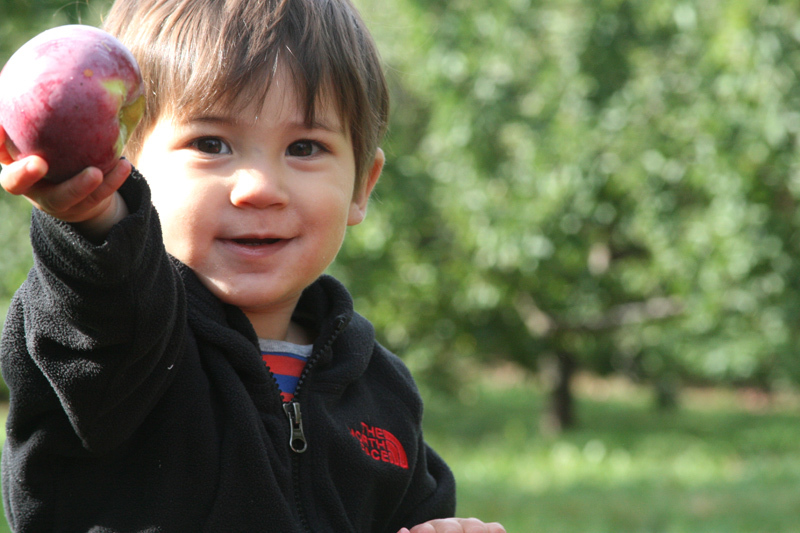 That is a really special photo of Max and his apple, too. 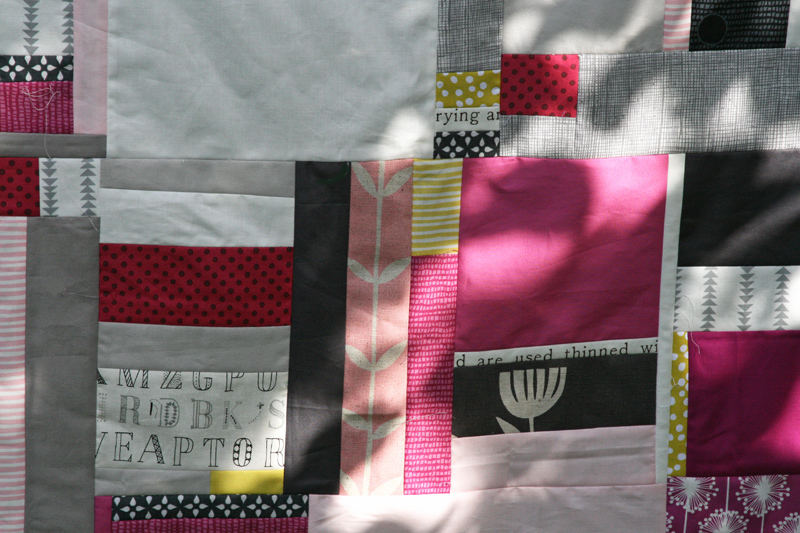 Sometimes the best quilts are the ones that don’t start out with a definite plan and just evolve! Totally agree that it has a FLWright-ish look. Really like this one! That quilt top is gorgeous! It reminds me of some modernist art that I saw when I was travelling in Europe in university. Sigh. I love it. And your adorable imp is getting downright elf-sized! I just wanted to say thank you for the inspiration. I am in a color, I would not say rut but I am stuck. I have some bold colors going on for some of the main piecing but trying to figure out what else to use. I am using grey but was not sure to use different shades that I have on hand to get this top I am working on done. Just wanted to say thanks for helping me out of being stuck! Sigh, I want to make a quilt like that. Without a plan. Just feeling your way. That is so what I need right now! Oh I love this – it’s beautiful as is the setting for the photo shoot. Your little helper is just adorable! 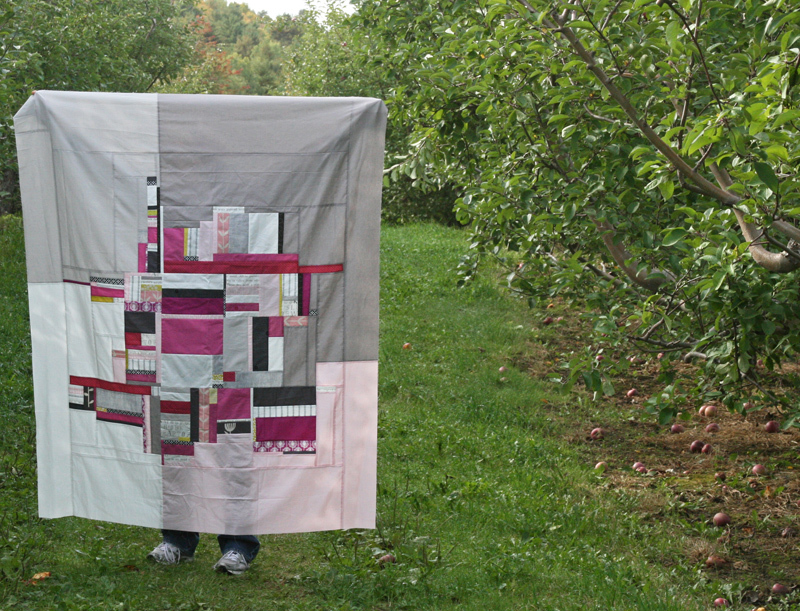 Improv quilts are always my favorite and this one is AMAZING!! I especially love that lemon yellow – that’s always a difficult color for me to find. It’s so pretty with those pinks and grays! Wowee wow wow! You have a gift for the use of color, tone, pattern, and scale… dare I say this is one of the most visually interesting and exciting quilts I have seen to date? It’s so inspiring. It’s a perfect balance between soft and hard, light and dark… the quiltwork in the center is exciting and it feels like it’s surrounded by a breath of air. Love it and can’t wait to see it quilted up. Thanks so much for sharing your amazing art and talent! I know I’m late in the day but I had to tell you how much I love this quilt.